"HE AIN'T KEN GRIFFEY JR. FOR NOTHING." Before Friday, Ken Griffey Jr. had never faced the Cincinnati Reds in his career. Griffey was 0-3 until the ninth inning when he faced Kip Wells with the bases loaded. After taking three straight balls, Griffey swung at two of Wells' pitches that would have both been obvious ball-fours. 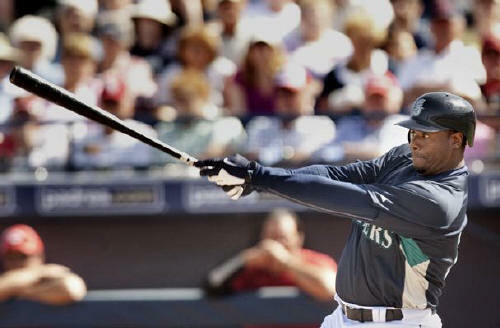 With a 3-2 count in the bottom of the ninth, bases loaded, and the Mariners trailing 5-2; Griffey belted a grand slam homerun to win the game. The Mariners defeated the Reds 6-5. "He ain’t Ken Griffey Jr. for nothing." Mike Leake and Travis Wood both pitched on Friday, further complicating the fifth spot decision. Both pitchers had corresponding hardy outings. Leake pitched four innings allowing one run on three hits. Wood also pitched four innings, allowing one run on five hits. Joey Votto is a self proclaimed slow starter. After going 3-4 (1HR and 3RBI) on Friday, his spring is beginning to look less stagnant. After being taken out of Monday's game against the Rockies for muscle spasms, Aroldis Chapman threw long toss on Thursday and participated in conditioning drills on Friday, showing no lingering signs of the complications. Chapman is still considered a candidate for the Reds' fifth spot and could possibly pitch again for the reds on either Sunday (against the Dodgers) or Wednesday (against the A's).